This photo was taken in Buenos Aires province, Argentina, last February. I was told that it is probably Mallophora genus, could anyone identify the species? Hi, any idea of the genus/species? Thanks! To me it looks like a Mallophora sp. but lets wait for Eric. This looks like Mallophora sylveirii, common from Brazil to Argentina. Thanks Eric! Appreciate very much your help. Regards! Hello Eric. I think this one is actually Mallophora bigoti. "Revision del genero Mallophora Macquart por sistematica alfa y taxonomia numerica (Diptera - Asilidae)" says that M. sylveirii has "anterior and middle legs with abundant yellow hair in tibiae and tarsus" as a diagnostic feature, and It's also distributed a little more to the north of the country. Mallophora bigoti on in the other hand is widely distributed in Buenos Aires, and the diagnosis says (translated from Spanish): "Blackish to dark brown body; head with the mystax, palpus, beard and genal hair mostly white. Abdomen blackish, with short black hairs and long white hairs, the latter on the posterior border of the three basal tergites; belly with thin black hairs in the three basal sternites and central region of the fourth; the rest with thin white hairs. Paws chestnut-blackish, with short hairs and black bristles; anterior and median tibias and tarsi with long whitish blanched hairs; This type of hair also occurs in the posterior femur, in the female these are thinner; posterior tarsus of the males with thin bristles and black bristles". Yes, I think you are correct, my bad: this must be bigoti! 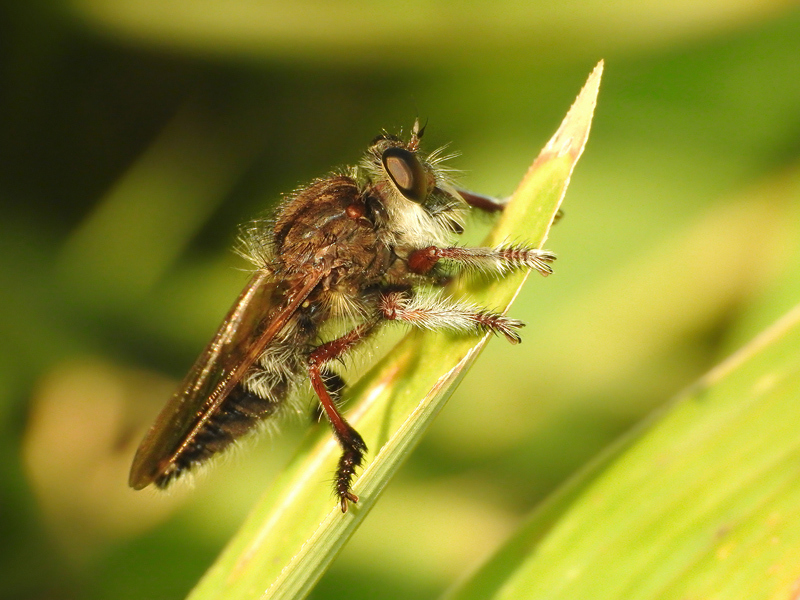 When I first saw this fly, I thought it was a particularly scruffy, somewhat off-colored Mallophora sylveirii (which seems to be the commonest species of Mallophora in Argentina)--forgetting about this species! Seems the difference in the longer hairs at the base of the abdomen are the best way to separate these two species: sylveirii has denser, yellower hair on the basal 3 tergites, while bigoti has thinner, whiter bands of hair present on just the basal 2 tergites.